Preheat your oven to 350 degrees. Cut your poblano peppers down the center (but not all of the way through) then across the top to open. 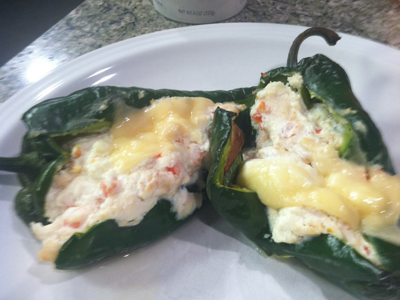 In a bowl, mix together the Greek yogurt, ricotta cheese, diced red bell pepper, jalapeño pepper, then gently fold in the crab meat. Spoon this filling into the center of each poblano pepper. Add the goat cheese to the top, then cover each with parmesan cheese. Place on a foil lined cookie sheet and bake for 30 minutes. Serve immediately and enjoy!